Alberta’s future rests on its ability to cultivate an engaged, skilled, and creative citizenry by providing high-quality instruction to young Albertans. The province has a tradition of excellent public education. Today, technology and innovation offer new opportunities to build on this strength. But not all novel approaches amount to progress. 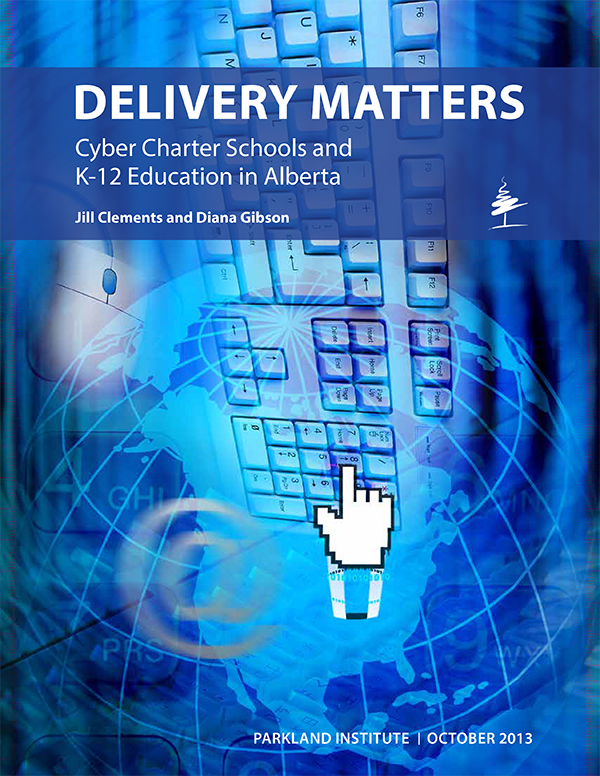 This report analyses the cyber charter school, a method of delivering K-12 curriculum that is gaining ground in the United States. In the cyber charter school, students and teachers interact via electronic media (email, telephone, audio/video conferencing) with only occasional face-to-face sessions. Much of the workload is expected to be self-directed, and formal instruction generally takes place online. Private commercial entities in the US are investing substantial resources in promoting for-profit cyber charter schools. This report is part of Parkland Institute’s ‘Delivery Matters’ series, which documents the higher costs, lower quality of services, and diminished accountability associated with the private, for-profit delivery of public services such as healthcare, education and public infrastructure maintenance. The data presented in this series has made clear that when the provincial government outsources, Albertans pay more and get less transparency and control. In recent times, Canada’s education sector has experienced significant increases in private delivery. The proportion of children in private schools in Canada grew by 20 per cent between 1995 and 2005. Alberta’s 2013 budget decreased funding for public schools while increasing financial support for private schools. Albertans may soon be obliged to make decisions about whether the cyber charter school is to have a place in the province’s education system. This report analyses the US experience with the for-profit cyber charter school. It documents how corporate interests, in cooperation with their political allies, have driven the cyber charter school movement in an effort to further privatize the US public school system. Inside of a decade, virtual schooling in the US has grown from a new idea to a mode of education impacting almost one in every 50 students. While technologically-enhanced means of delivering curriculum can have positive outcomes for some students, there is reason to be concerned that administrators are turning to cyber charter schools not as a means of pedagogical innovation but in an effort to deal with budgetary constraints. Delivering off-the-shelf, bulk-purchased online education with tutors accessed largely online has a completely different cost profile than does traditional education, with brick-and-mortar schools and in-class instruction. As a result, public funding for K-12 students that is diverted to for-profit cyber charter schools serves to enrich private interests. K12 Inc., a major corporate player in US K-12 education, amassed profits of $140 million in 2007 alone, the majority of which was from cyber charter schools contracts. Apple, Dell, and Google are among the large corporations looking for their piece of the pie – and distorting public education policy as they engage in lobbying and political contributions intended to ensure their own profitability. While research on student outcomes remains preliminary, cyber charter schools have a patchy record, including significant risk of poorer education outcomes and very high rates of withdrawal. They also fail to address what the public school system has long taught as the skills of citizenship — how to get along with others, how to reason and deliberate, how to tolerate differences. From this perspective, cyber charter schools risk leaving large gaps in the education of young people. The US experience with cyber charter schools makes clear that the private delivery of public education is a risky path. There is little evidence to demonstrate that corporate interests add value in training the compassionate, skilled, and technically savvy citizens of the future. Instead, the cyber charter schools model encourages profiteering and mismanagement at public expense and at significant risk to students. In years to come, Alberta likely will be under increased pressure to privatize education and cut costs, as will cash-strapped school boards. $e case will be made in education, as it has been in health care, that it does not matter who delivers the service as long as it is publicly funded. However, this report makes clear that delivery matters. As demonstrated by the publications in Parkland Institute’s ‘Delivery Matters’ series, the privatization of public services has negative effects on both cost and quality. It is not in the best interest of students or the public at large to divert public funds into corporate coffers in support of a questionable learning model. Ultimately, it is in the public interest to continue to harness technological advances, build on evidence-based teaching innovations, and provide a variety of high-quality and pedagogically sound learning options within the public school system.